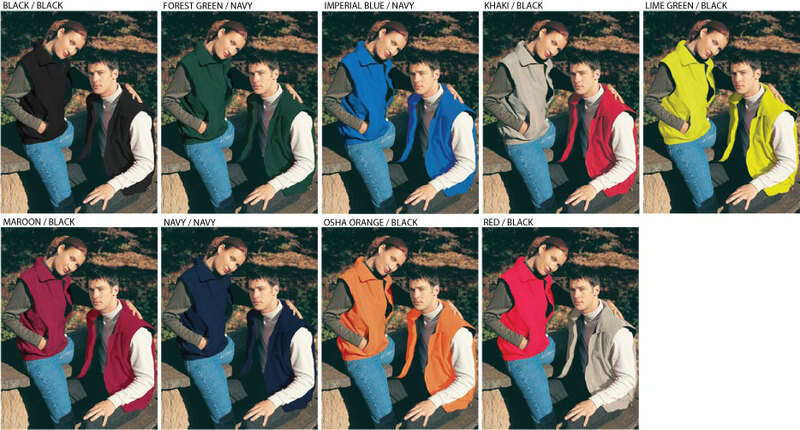 Tri-Mountain Unisex Vest - 8400 Ridge Rider [TM8400RidgeRider] - $25.99 : Sogowear Outfitters!, Polo Shirts, Golf Shirts, Jackets, Fashion Fleece, Woven Shirts and More! The 8400 Ridge Rider Vest from Tri-Mountain features a waterproof/windproof shell and Toughlan nylon, and is fully lined with super heavyweight 11.5 oz. Anti-Pilling PANDA FLEECE. The collar on the 8400 features Polyfill material for extra warmth. Banded and elastic waistband at the bottom for a custom fit. -Unisex for men and woman. -Features two front zipper pockets and one inner right chest pocket. -The 8400 Ridge Rider is made of heavyweight 11.5 oz. anti-pilling fleece material. XS, S, M, L, XL, 2XL, 3XL, 4XL (Available in all colors). 5XL, 6XL, LT, XLT, 2XLT, 3XLT, 4XLT, 5XLT, 6XLT (Available in marked colors).